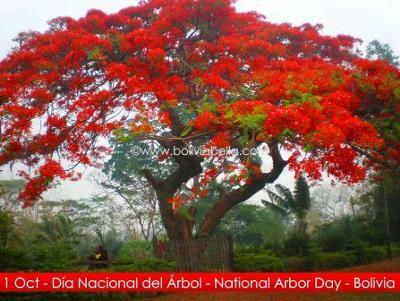 October 1st is National Arbor Day in Bolivia (National Day of the Tree or Día Nacional del Árbol). This day is set aside to create awareness about the importance of conserving our trees because they are an invaluable natural resource. Bolivia has over 2 million hectares of tropical forest and was the first country in the world to certify its tropical forests. This means that lumber companies must follow strict requirements regarding logging and the use and sale of lumber and wood products both nationally and internationally. In fact, every log legally extracted from a tropical forest in Bolivia is registered and issued a certificate of origin. Unfortunately, Bolivia is also home to many illegal loggers who indiscriminately fell trees and extract our lumber from our forests. In addition, over 300,000 hectares of forest are illegally burned each year using slash-and-burn clearing techniques for agriculture. Nearly 50% of Bolivia is covered in forest and 76% of all the country's forests are found in the three states of Pando, Beni and Santa Cruz. Without trees, we would not be able to breathe. Trees inhale impurities in the air, such as carbon dioxide, and exhale oxygen, purifying our air for us. Click here to read more about Bolivia's forests.